I left for the market this morning with the intention of buying asparagus, rhubarb, and fish. You can see how well that plan worked out. A thunderstorm blew through around dawn and I guess a lot of farmers decided to stay home, including those with rhubarb and asparagus. It was pretty quiet at the market, which is how I ended up with all these leafy greens: my favorite farmer kept tucking spinach and kale into my basket as we chatted. I have no idea what he charged me for and what he didn’t. Or what I’m going to do with all that spinach. This entry was posted on June 11, 2011 by Megan @ When Harry Met Salad. 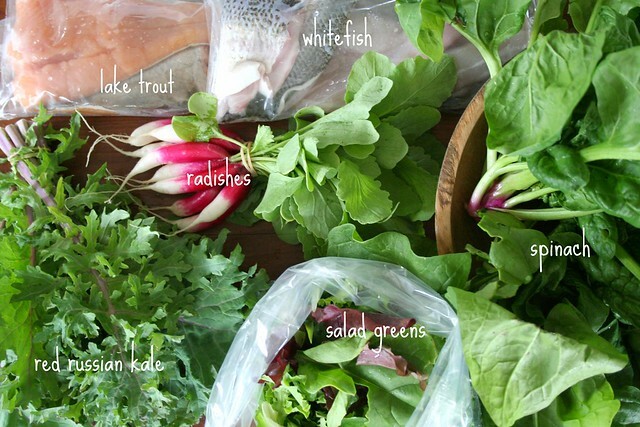 It was filed under farmers market and was tagged with fresh produce, lake trout, radishes, red russian kale, salad mix, spinach, spring, vegetables, whitefish. with what and how are you taking your photos? are you editing them with Adobe Photo Editer? they are really beautiful! Thank you! I use a Canon Digital Rebel XT with the standard kit lens. Generally speaking, I arrange things on my dining room table (where there’s nice natural light) and then stand on a chair to shoot them from overhead. I do a little editing in Picnik to correct for underexposure and I usually warm the colors up a bit. Well the photos are stunning! Great job! I’m starting to work on my own photography a bit because I want my own blog (http://acookingmizer.wordpress.com) to be as interesting, but I just have a regular old not fancy digital point and shoot, although I do use the tulip icon because I get better resolution that way and my close-ups are better defined. I’m always searching other blogs to get ideas, and now I find myself buying little things here and there to jazz up my photos, since I dont have a place to take pictures that really helps my food to stand out. Thank you! You can get nice results with just a point and shoot, but natural light is key. If your kitchen doesn’t have natural light, you can always stage your photos in another part of your house. I have to do that sometimes, especially in the winter.